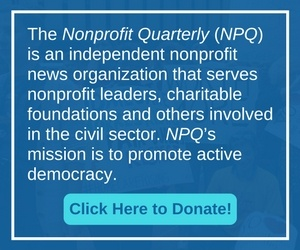 Welcome to the Spring 2012 issue of the Nonprofit Quarterly. This classic from our print magazine on how Internet-driven movements proliferate and gather momentum is particularly relevant with today’s story on the Black Lives Matter movement below. Yesterday, we were treated to the berating of a member of the press corps by the president-elect following a set-to between him and Meryl Streep, who was championing the role of a free press in democracy and urging people to give to the Committee to Protect Journalists. To highlight the overlap between the work of the civil sector and journalism, we present an interview with Joel Simon, who heads that organization. One problem with using “impact measurement” as a sole or primary way to judge effectiveness is that sometimes in advocacy on a political issue it may take all you have just to keep the flag flying and the issue surfaced in the right way – decades may pass and apparently no one wants to listen and then…all of a sudden an opening occurs. Leaders of contested causes talk below about what it takes to exhibit brave political leadership in the 21st century. The president of the Government Accountability Project discusses whistleblowing as an act of individual bravery and leadership, as well as how nonprofits working in the field where the exposé has occurred can help. An activist who has been on the front lines of the battle for economic justice for decades describes his pleased interaction with Occupy Wall Street. When a new boss has the entire organization walking on eggshells, a staff member begins to dread going in to the office.